Offering substantial savings over purchasing equipment new, buying used woodwork machinery must be approached with caution. After paying for repair costs, purchasing equipment that is not in good working condition will often end up being more expensive in the long run than buying tools new. 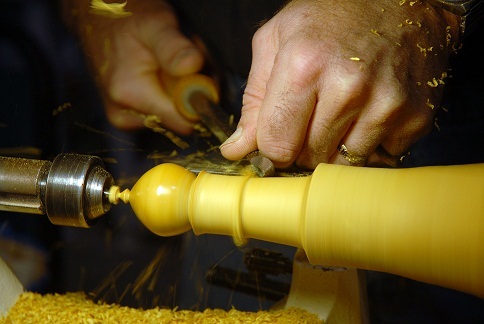 Before buying used equipment, here are the top 5 tips for buying used woodwork machinery. Great deals can be found online, but always examine the equipment in person before buying. The only exception to this rule is if you are dealing with a long established and reputable dealer with a solid reputation and track record. Be sure to ask about the inspection and return policy, shipping information and get all details in writing before you buy. Never buy used woodworking machinery from a private seller if you cannot inspect the equipment beforehand. The motor is the most important, and most expensive, component on any piece of woodworking machinery. Run the equipment, under load, while listening to the motor for any abnormal sounds, such as loose bushing or grinding bearings. Feel the motor casing, with your hand, both during and after testing. The casing of a motor that is in good condition will be barely warm to the touch. If the casing is very warm it is an indication of potential problems. A hot casing is a tipoff that repairs are in the near future. If buying used woodworking equipment from a dealer, ask if the machinery has been fully reconditioned, and then ask exactly what the reconditioning process involved. At the very least the motor should have been dissembled and all parts inspected and any worn parts replaced. A through reconditioning should also include inspection of the wiring and switches and well as the equipment housing and stand. Professionally reconditioned equipment should come with a warranty comparable to new machinery. If buying used woodwork machinery from a professional woodworker or woodworking shop, insist on reviewing service records that will indicate how often the machinery was serviced and any repairs that have been made, including replaced parts. Look to see when the equipment was first placed into service and how many hours it was used between scheduled maintenance. Old does not always mean inferior or worn out. There is a lot of truth to the axiom, "They don’t make them like they used to," and while most new quality tools are made to last a lifetime, many older woodworking power tools were literally built to last forever. Additionally, if buying used machinery from a weekend woodworker, equipment may not have been used very heavily and still be in like-new condition. For quality CNC machinery and other metalworking tools, Ron Mack can help. They install every machine they sell and also stock a wide range of woodworking machinery.